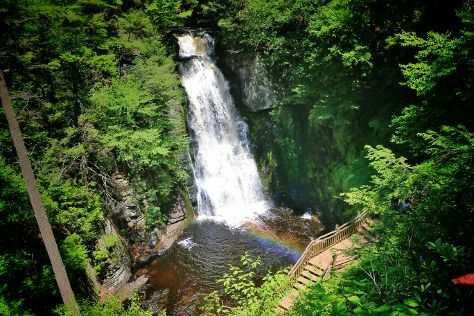 Kick off your visit on the 28th (Fri): try your luck at Mount Airy Casino, look for gifts at Country Kettle, and then take in the dramatic scenery at Bushkill Falls. Get ready for a full day of sightseeing on the next day: cool off at Camelbeach Mountain Waterpark. To find where to stay, traveler tips, ratings, and more tourist information, read Shawnee on Delaware trip builder website . Newark to Shawnee on Delaware is an approximately 1.5-hour car ride. Plan for slightly colder temperatures traveling from Newark in December, with highs in Shawnee on Delaware at 38°F and lows at 24°F. Finish your sightseeing early on the 29th (Sat) so you can travel to Wilkes-Barre. Wilkes-Barre is a city in the Commonwealth of Pennsylvania and the county seat of Luzerne County. Kick off your visit on the 30th (Sun): take in the dramatic natural features at Seven Tubs Natural Area, see the interesting displays at The Electric City Trolley Station and Museum, and then try to win big at Mohegan Sun Pocono. To see ratings, photos, maps, and tourist information, refer to the Wilkes-Barre trip itinerary planner. You can drive from Shawnee on Delaware to Wilkes-Barre in 1.5 hours. In December, plan for daily highs up to 41°F, and evening lows to 29°F. Finish your sightseeing early on the 30th (Sun) to allow enough time to travel back home.